Ogo personal mobility device integrates a unique Active Seat Control system with self-balancing technology. Ogo is a powerful two-wheeled self-balancing commuting device that is perfectly optimized to glide smoothly on both smooth and uneven terrains. This is because of the device’s unique self-balancing platform. The platform does an excellent job of keeping drivers level in their seat while ensuring Ogo doesn’t tilt even while navigating troughs or scaling inclines. 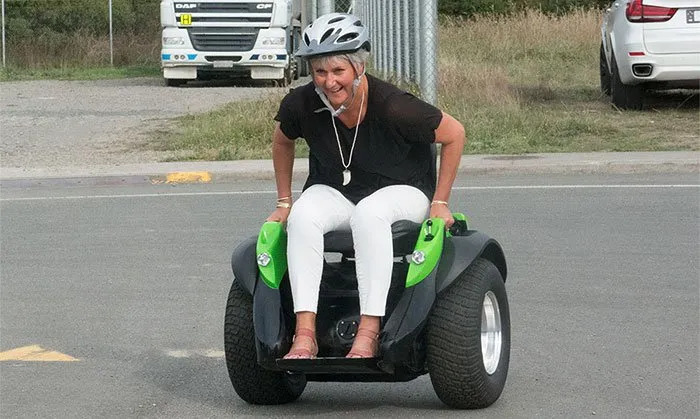 This self-balancing ability makes Ogo a great choice for a wide range of terrains including beaches, pathways, tracks, and forests; terrains other personal mobility devices may find difficult to navigate. Ogo comes as a standard set up that’s capable of fitting through doorways and other small spaces. Rest assured, you’d have no problem searching for a parking space for your device. If you need to better equip Ogo for tougher terrains, you can change to the additional off-road kit that allows you to go virtually anywhere. The driver has the option of choosing between two riding modes that are activated by a single lever. If you choose the joystick mode, you’ll control the forward and backward movement by shifting your body weight to the corresponding direction. Sideways movements, on the other hand, are controlled by shifting the joystick to the desired direction. The second mode is the Active Seat Control (ASC) mode. In this mode, the seat of Ogo is unlocked and you can control the forward, backward and sideways movement by shifting your weight on the seat. This mode offers the possibility of controlling your ride without using your hands. The only downside here is that it might take a while to master the ASC mode. Because you’ll need a fair amount of practice before you can safely drive and enjoy the Ogo, the manufacturers advise that prospective buyers should give the device a trial before buying one. Ogo has dedicated agents that organize trials for buyers and explain them the reservation process. You can visit this link to find an Ogo agent near you. How heavy is it when putting in a car trunk ? I just would like to try this out looks great for my disability I can balance perfect.